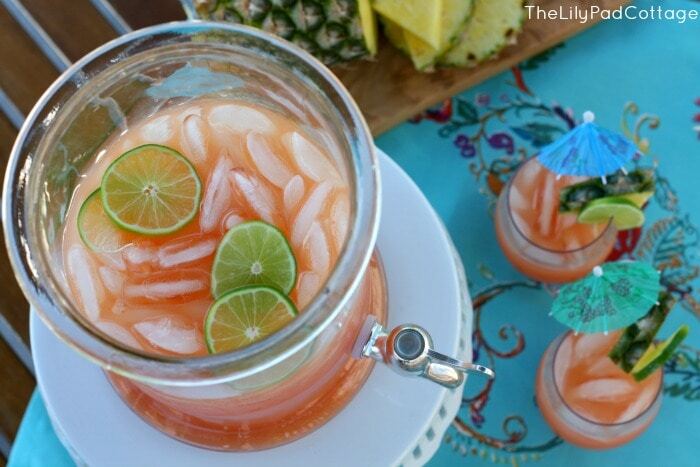 Today I’m sharing my go to summer drink for when we are entertaining – my Best Ever Rum Punch recipe. It’s the perfect summer time drink, and hey if you aren’t a drinker it’s delicious without the rum too. 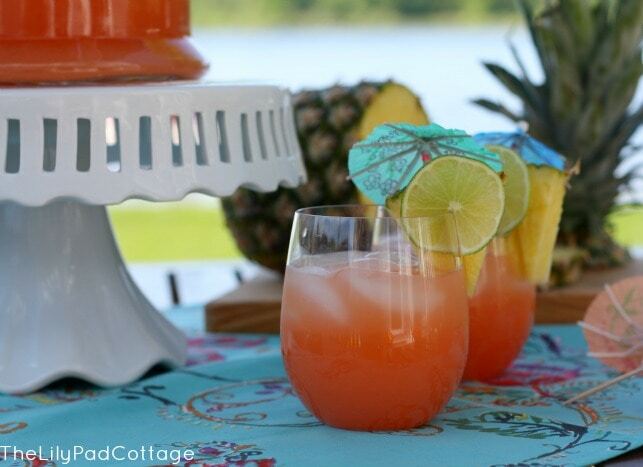 We spend most of our summer entertaining friends, boating and splashing in the water and it’s always nice to have a quick and easy drink recipe that serves a crowd and is refreshing on a hot summer day. This one is always a hit with our friends! Be prepared to feel like you are on a tropical island when you drink this – I’ll admit, I even make this every once in a while in the dead of winter when I just can’t stand the snow any longer and need a mini-vacation! I just love the pretty pink color! Especially with the pop of teal from these gorgeous napkins. I picked them up at Cost Plus World Market along with the cute umbrellas (everything tastes better with a party umbrella!) I found the stemless plastic wine glasses there too, perfect for our backyard or on the boat where glass is not the best idea. If you leave out the rum this is also the perfect non-alcoholic punch for a baby or bridal shower with the pretty pink color. Yum, I think I need to go mix up a batch, relax by the water, read a magazine, nap in the sun….oh wait, there’s that whole parenting thing to attend to – so, I’ll go jump in the water, splash my kids, build a sandcastle, get their cute behinds in bed and enjoy my cocktail with the sunset. Even better! Mix all ingredients in a large pitcher add ice and enjoy! Note - You can make individual serving sized cocktails as well just keep all equal parts except for the grenadine - just add a splash for color. This looks so good! 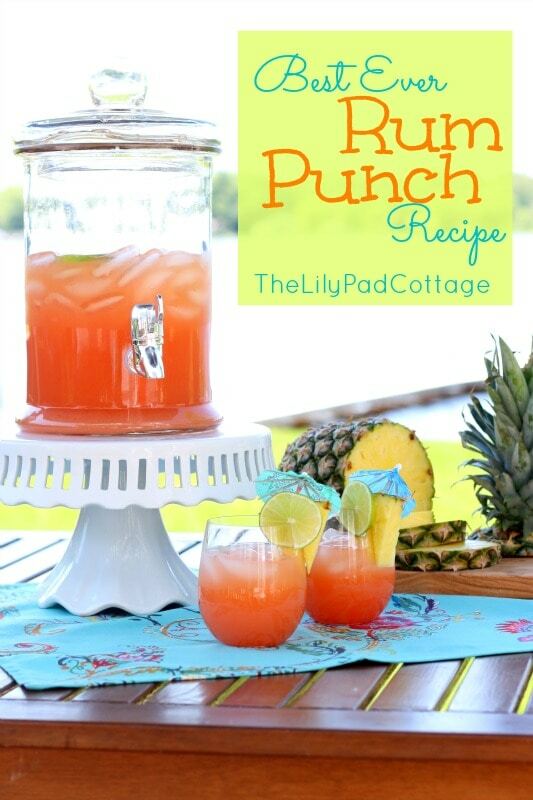 I’ve been looking for a good summer drink recipe…I’m trying this one for sure! :) Thanks for sharing! You are so welcome April :) hope you like it! This would ttotally go well with some smores ice cream sandwiches!! Hot summer day, we’re ready for you! I already got the perfect bikini for this. ha! Sounds like the perfect afternoon! Yum! This looks super delicious, pinning for sure! 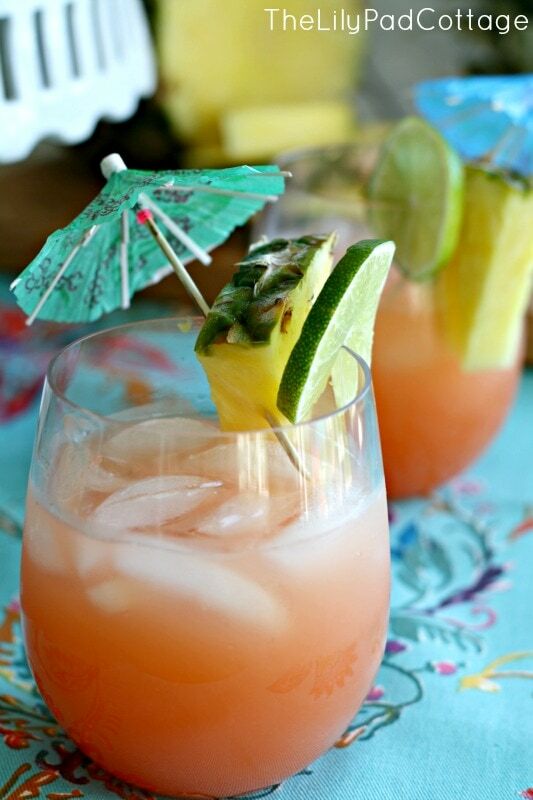 I’m stopping by to let you know I featured this on my blog today as part of a roundup of 25 Refreshing Summer Cocktails! Feel free to stop by and grab a Featured button if you’d like, and thanks again for the great recipe! Do you use white rum? Or could you use dark, spiced or even a flavored rum? I too need to know how much this serves I want to make it for our wedding Saturday and we have 100 people coming! HELP!